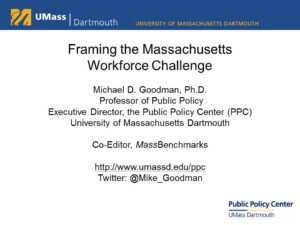 Presentation from STEM and the Massachusetts Workforce Challenge, March 22, 2019. This supplementary report provides more detailed information and profiles of school intervention strategies in ten states and four districts, along with further analysis of high-performing, high-poverty schools. 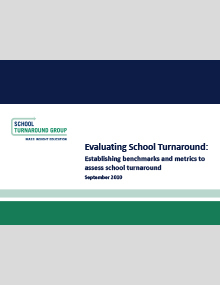 The Turnaround Challenge was published in November 2007. 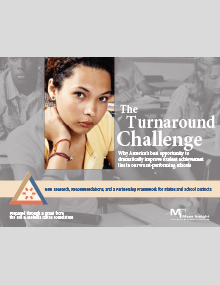 To date, more than 200,000 copies of the main report have been downloaded, and the report's framework is being used to develop turnaround strategies in dozens of schools, districts and states, and is informing federal policy as well. 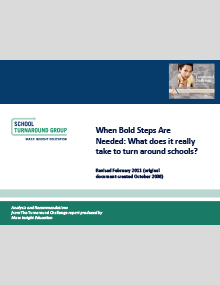 Use this presentation file to engage policymakers, practitioners and others about the ideas in The Turnaround Challenge. The slide deck summarizes the major points from the research and includes most of the major graphics. It also offers brief notes for presenters for every slide. (The notes are visible after saving to your desktop and opening the file.) MIE grants permission for the file to be used (and for the slides to be copied and distributed) for non-commercial use. Permission is also granted for the incorporation of material from this file in other works created for non-commercial use, provided that appropriate acknowledgement is given. We retain the copyright and reserve all other rights. 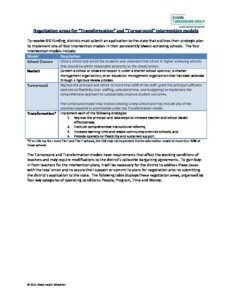 This grid displays the federal requirements and recommendations for the turnaround and transformation models that require modifications to traditional collective bargaining agreements. In a school district that serves largely under-represented populations of students, going from having only four qualifying Advanced Placement exam scores to 34 is something to celebrate. Even more remarkable is when one single teacher contributes to 15% of the state’s qualifying biology exam scores by minority students. One teacher in a Gateway City that has historically struggled with academic success is making a difference every day. This tool allows districts and local unions to analyze their existing CBA for the key contract elements in the conditions areas of People, Program, Time and Money. Alicia Lima, like fellow students in Boston Public Schools, came to the city with English as a second language. Although her teachers recognized her academic talent early on, her hesitation held her back from truly excelling. It was not until she was encouraged to enroll in Advanced Placement classes, knowing that MIE was providing student support, that Alicia conquered her fears. 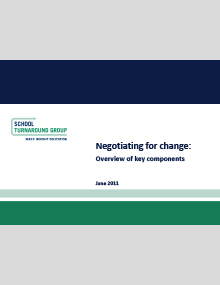 This document summarizes some key points from the full publication, including an overview of the non-negotiable contract elements that must be negotiated to create the conditions for turnaround and the various options for contract modifications. Robert Bunzell is an active senior at one of MIE’s school partners that doubled their number of qualifying exam scores after their first year in the AP STEM & English program. 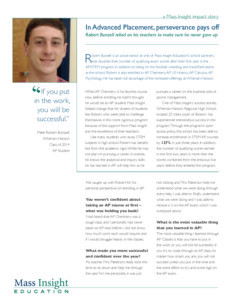 In addition to being on the football, wrestling, and track/field teams at the school, Robert is also enrolled in AP Chemistry, AP US History, AP Calculus and AP Psychology. He has taken full advantage of the increased offerings at Whitman-Hanson. Annia Bosse, a graduate of East Boston High School, proves that investing in students while they are in high school leads to a more successful college and career pathway. Not only did Annia participate in MIEt’s program through three AP STEM courses, she completed an internship at State Street as part of MIE's Student Partners program to which she credits the success she is now achieving in college. Allison Bergeron is part of the English Department at Drury High School in North Adams, Massachusetts. With the support of MIE, she and Drury’s two other AP Teachers (Sara Luczynski and Molly Meczwyor) nearly doubled the number of qualifying scores in AP English in just their first year of the program. 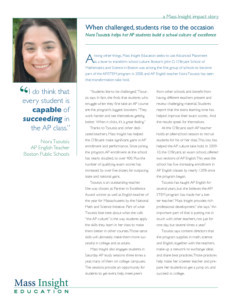 The school is also experiencing a cultural shift where AP is helping more students, not just the select few, strive to be better and more successful learners. The Indiana State Board of Education has not been shy about exercising its authority to intervene in chronically underperforming schools. Under the state’s Public Law 221, the Indiana Board can mandate specific interventions for any school that has received six consecutive failing grades under the state’s accountability system – up to a complete takeover by the state. "Five days of school a week is enough for most teenagers, but no one told that to the more than 100 Jefferson Parish high school students who started streaming into the district’s central office building at 8 a.m. on a recent Saturday." State education agencies (SEAs) can pull a powerful lever for school turnaround by setting goals publicly, and releasing reports on progress toward those goals at turnaround schools to build public support for turnaround efforts. Creating these reports does not require a big lift: the information for reporting can be from data that has already been gathered. 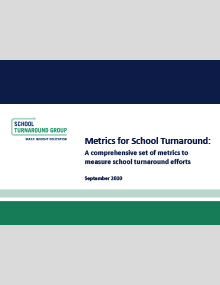 This report clarifies indicators and metrics that can be most helpful for tracking progress toward goals, and explains where to find the data to inform these metrics. 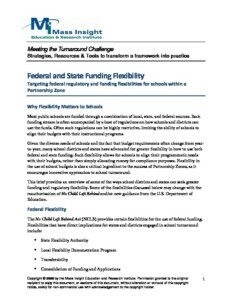 This toolkit clarifies the spending rules that apply to supporting schoolwide improvement programs with Title I dollars, and provides considerations for states, school districts and schoolwide schools that want to rethink the way they use Title I funds. 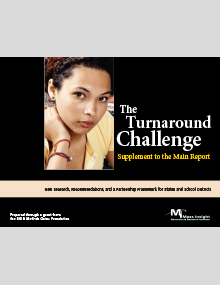 This main publication identifies the contract elements that must be bargained to create the conditions for successful turnaround; provides examples of states, districts and unions that have begun this challenging but necessary work to make all schools, for all children, highly effective learning environments, and; suggests strategies for districts and unions to pursue collaborative negotiation. This publication combines lessons learned from state RFP (Request for Proposal) processes used to identify Lead Partners. 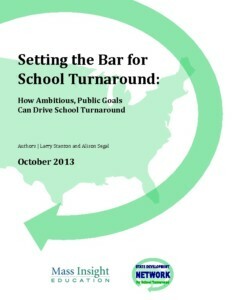 Partners play a critical role in advancing state and district turnaround strategies. Lead Partners, as defined by the STG, are private organizations or units of central offices on contract with the district or state to turn around schools. 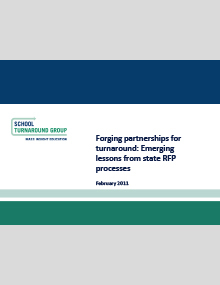 The RFP process is a critical first step used to vet and select partners to manage school turnaround efforts. 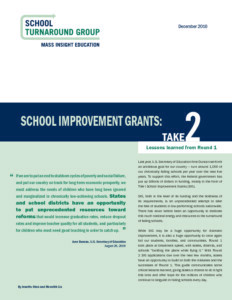 This report combines key learnings including how to 1) design and manage the RFP process; 2) solicit proposals from potential partners; 3) review proposals; and 4) support district and school leaders as they select partners. These strategies are drawn from our observations of the field, interviews with state leaders, and in-depth experience working directly with states. 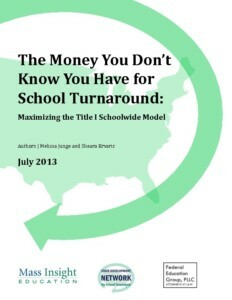 This resource compiles data from successful turnaround schools across the country. The data suggest what is achievable in years 1, 2, etc. 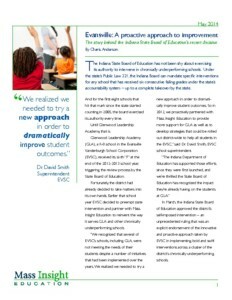 under a turnaround model and can inform benchmarks in other states, districts, and schools. 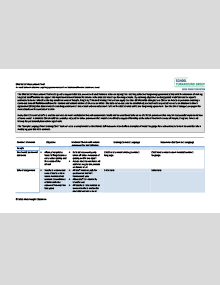 This tool lists critical variables or metrics to track as part of a robust evaluation system. These metrics fall within 6 categories: (1) demographic data, (2) the school environment, (3) student achievement, (4) community perceptions, (5) instructional data, and (6) school facilities and resources. This main publication provides a framework for evaluation in the context of turnaround and differentiates between leading and lagging indicators of improvement. It outlines a process for setting school goals, collecting aligned data, and using data to inform decision-making. A number of groundbreaking changes in the federal environment, most notably the introduction of Race to the Top, have led to dramatic changes in the state policy landscape for school turnaround. 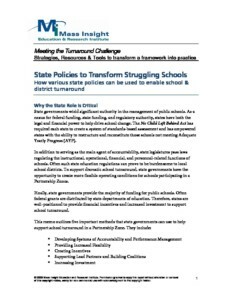 This publication analyzes these major changes and offers advice on how state policy can create optimal conditions for school turnaround. 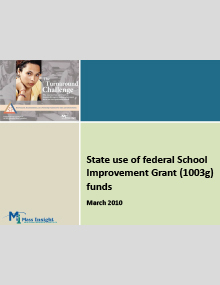 This publication provides recommendations to states on the most effective process to allocate the Title 1 School Improvement grants under the new federal guidelines. Due to demand from our states, this publication also has an addendum that answers a set of more targeted questions. Lead Partners are non-profit organizations or units of central offices on contract with the district central office or state to turn around schools. 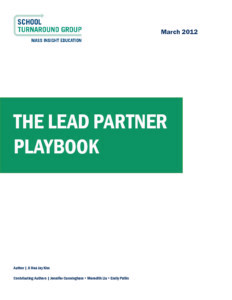 This publication examines the lead partner marketplace, the role of the lead partner, and the relationship between the Lead Partner, the district and the state education agency (SEA). The Memorandum of Understanding (MOU) is a complex document that sets the terms of the relationship between a Lead Partner and its contracting state or district. This publication provides guidance on the components of an effective MOU and the process required to develop one. 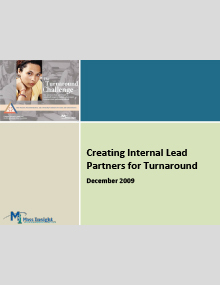 An Internal Lead Partner (ILP) is a carve-out unit within a district or state central office that fulfills the same responsibilities as an external Lead Partner (i.e., autonomy from traditional structures and policies, authority over decisions, and accountability for student performance). 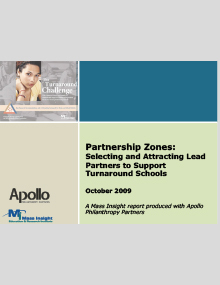 This report examines the role of Internal Lead Partners in district turnaround strategies. 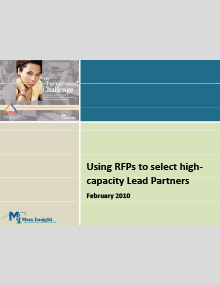 States and districts can use the Request for Proposal (RFP) process to recruit and procure high-quality Lead Partners. The states and districts can then create a preferred provider list of approved partners, or the State Turnaround Office can directly match up partners with schools and districts. This document explains the process to develop, issue, and review RFPs, including the key success factors and pitfalls. This list of the Essential Conditions for a Partnership Zone provides an overview of the key features of a turnaround space. The conditions are separated by content area, and include: people, time, money and program. The Lead Partner, a non-profit organization or unit of the central office on contract with the central office or state for small clusters of schools, is a key innovation in the turnaround space. This tool describes the potential sources of Lead Partners and addresses the conditions required to attract them to districts and states. This document provides technical information about the various federal funding flexibility options and waivers that are available to local education agencies (LEAs) and state education agencies (SEAs) from the U.S. Department of Education. In relation to Title I programs, fund transferability, flexibility demonstration authorization, consolidation of reporting requirements, block granting, and waiver authorities are specified as possible places for policy changes that could assist in the implementation of Partnership Zones. Examples of notable state practices currently being used are also included. These profiles feature organizations and programs that are working to build the capacity for turnaround in schools and districts. Turning around chronically low-performing schools requires a new type of skills, not usually taught in traditional education training programs, and a growing group of entrepreneurial organizations is helping meet the increasing demand for turnaround-oriented education leaders, administrators and district staff. This 70-page guide offers districts a step-by-step approach for creating the flexible operating conditions, specialized capacity, and community-based clusters of schools to turn around their lowest-performing schools.